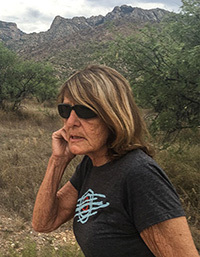 Joy Williams, University of Wyoming Creative Writing Program Eminent Writer-in-Residence, is the recipient of the prestigious PEN/Malamud Award for Excellence in the Short Story. Williams is the 28th recipient of the award, given annually since 1988 to honor the late Bernard Malamud. The award recognizes a body of work that demonstrates excellence in the art of short fiction. Williams, from Tucson, Ariz., first joined the UW Creative Writing Program during the 2008-09 academic year, and comes to campus each October and April. Her stories are known for their crisp prose, grim wit and an unsparing exploration of the dark side of hope. “Joy Williams’ short stories are, sentence to sentence, incandescent, witty, alarming and often hilarious while affecting seeming inadvertence -- but not really -- in their powerful access to our human condition. She is a stirring writer and has long been deserving of the Malamud Award,” says Richard Ford, a member of the PEN/Malamud selection committee. At UW, Williams teaches a short course, consults on student manuscripts, provides public readings and participates on MFA graduate committees. Lockwood adds that Williams is generous with her time, is deeply devoted to students and is passionate about UW’s program. Williams is the author of four collections of short fiction, four novels and two works of nonfiction. She has been nominated for the National Book Award for Fiction, and has been a finalist for both the Pulitzer Prize in Fiction and the National Book Critics Circle Award for Criticism. Among her awards are the Strauss Living Award from the American Academy of Arts and Letters and the Rea Award for the Short Story. As the PEN/Malamud Award winner, Williams will read at the 2016-17 PEN/Faulkner Reading Series at the Folger Shakespeare Library in Washington, D.C., and will receive a $5,000 prize. The selection committee is composed of a three-member panel of the PEN/Faulkner Board of Directors. The PEN/Faulkner Foundation, celebrating its 36th year, is committed to building audiences for literature and bringing writers together with their readers.